What is holding you back from reaching your musical goals. What to focus on when you practice to improve as fast as possible. Clarity is your greatest power as a guitar player. It gives you the ability to make maximum progress in minimum time. To have more clarity, you need the right guitar practice habits that enable you to focus on the right things, at the right time, in the right way. You also need to avoid common guitar practice obstacles that slow down your progress. Most guitarists practice with no direction and without a clear strategy. This is called aimless practicing. Aimless practice happens when you collect tab of random songs, solos or exercises you find online and try to practice them without clear objectives. This often leads to overwhelm and frustration as you collect a lot of practice materials but never seem to master any of them. You also have no way to measure your progress over time This means you don’t really know if your practicing is making you a better guitar player or not. 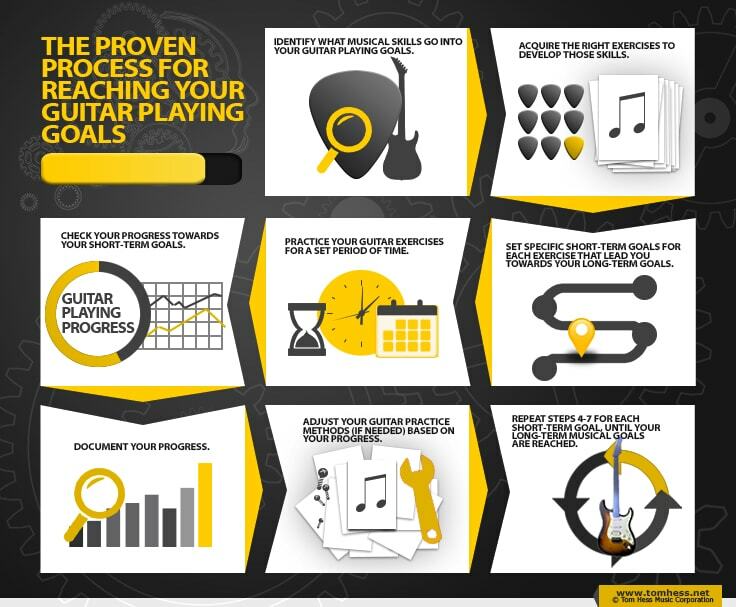 Set clear long-term goals for your guitar playing. Seek out the best guitar practice materials to develop the skills that help you reach your goals. Track your musical progress each week to see how close you are to reaching your musical goals. This process gives you clarity on what to practice to become the guitarist you want to be. Knowing what to practice is only one part of your musical progress. The other part is knowing how to practice correctly for maximum results. Practicing guitar with your full attention and focusing on the right things, at the right time in the right way. This ensures that your time is not being wasted and every minute of your practice time makes you a better guitar player. Solving your guitar playing problems easily, with minimum frustration. Creating effective guitar practice schedules for yourself. Your guitar practice schedules are your blueprint to playing guitar the way you want. Having patience and perseverance. Perseverance is key to solving all your guitar playing challenges. It helps you think through problems in your guitar playing and keep trying new solutions until you find the right one. Want to see an example of correct guitar practice? 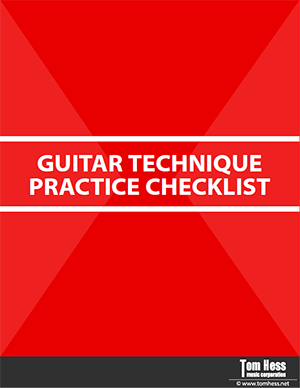 Download this free guitar practice checklist and learn what it means to practice guitar technique correctly. (It’s free and no email address is required). Print it out and use it to speed up your progress. Tip: not everything on guitar takes a long time to improve. There are 5 guitar playing tricks you can learn in 10 minutes that make your playing sound better immediately. Download this free guitar playing eGuide to learn how to sound great, no matter what you play. Online videos, tablature or pre-made courses cannot answer your questions, fix your mistakes, help you avoid bad habits, give you feedback on your playing or support you when you feel frustrated. They also cannot tailor themselves to your skill level and your musical interests. This means you are left on your own to figure everything out through trial and error. An expert guitar teacher designs a step-by-step learning strategy specifically for you and holds your hand through every step of reaching your goals. This gives you the clarity you need to reach your guitar playing goals fast, while enjoying the process. Many guitarists spend too much time practicing skills they are already strong in, while ignoring their weaknesses. This causes your playing to become unbalanced, as you improve in some areas and remain very weak in others. Your ability to apply your musical strengths is going to be severely limited by your musical weaknesses. Read this article to learn how to avoid becoming out of balance as a guitarist. Playing guitar with bad habits is like trying to run with your shoelaces tied together. 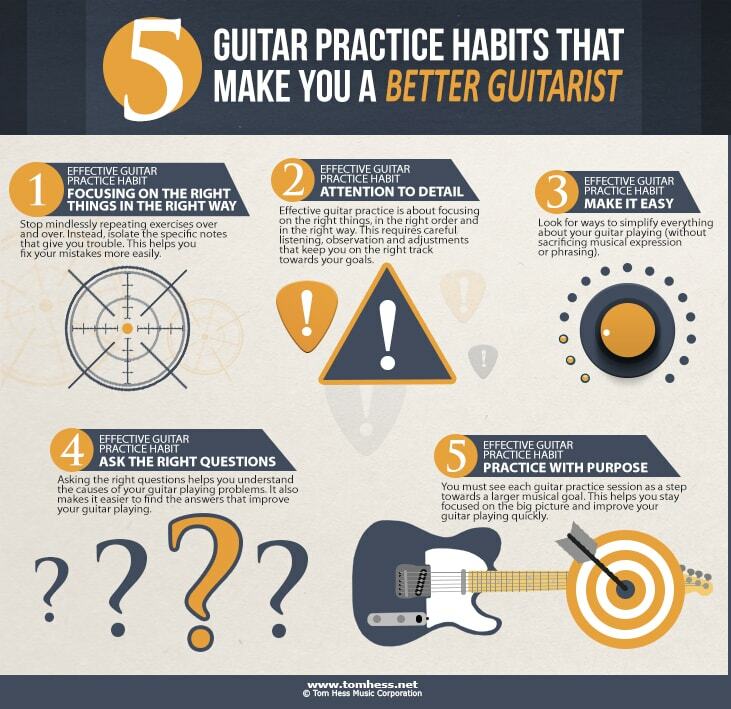 Challenge #1: Not knowing what bad habits are holding back your guitar playing. The solution is to get feedback on your guitar playing from an expert teacher. A great teacher can easily identify your bad habits, so you know exactly what to focus on when you practice. Challenge #2: Not practicing slowly enough to fix your bad habits. It takes a lot of concertation to undo a habit you’ve played with for years and replace it with a new one. The faster you play, the harder it is for your brain to concentrate and the longer it takes to fix your bad habit. You now know more about improving your guitar playing than you have before. The next step is to learn easy ways to make your playing sound better without a lot of practice. Download this free eGuide to get 5 easy guitar playing tricks & make your guitar playing sound better in the next 10 minutes. Get the best online lessons for rock guitar players and become the musician you've always wanted to be.